Pricking a finger everyday is just part of everyday life for many diabetes patients. A non-invasive measurement approach could release them from the constant pain of pin pricks. 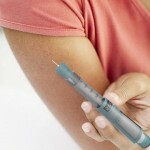 Should People Who Don’t have Diabetes Take Metformin?